You are here: Home / News / Gregg Popovich has become the most socially outspoken coach in sports. 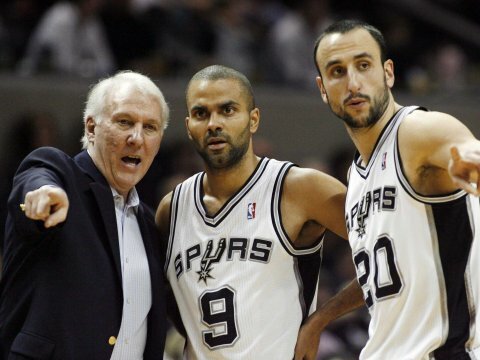 Gregg Popovich has become the most socially outspoken coach in sports. (ThyBlackMan.com) Being a head coach is truly a leadership position. Head coaches not only teach athletes about how to get better, work within the team dynamic, and how to achieve goals but they must also must manage egos and team morale over the course of a season. Because of their life experiences, coaches, or managers in baseball, are known for having a broader outlook about society than the younger players that they manage or coach. There is no league in professional sports that has more coaches who publicly address social issues than the National Basketball Association. Following the election of Donald Trump as the U.S. President last year, coaches like Golden State Warriors head coach Steve Kerr and Detroit Pistons head coach Stan Van Gundy spoke about Trump in critical ways. However, no coach in any sport as been as outspoken about Donald Trump and other social issues than San Antonio Spurs head coach Gregg Popovich. Gregg Popovich is not only the longest tenured head coach in the NBA, he is the longest tenured coach in professional sports in America, being at his current job longer than Bill Belichick with the New England Patriots of the NFL and Mike Scioscia of the Los Angeles Angels of Anaheim of Major League Baseball. The longest tenured coach in the National Hockey League is Joel Quenneville in Chicago. Popovich became the Spurs head coach after the first 18 games of the 1996–97 NBA season and has been there ever since including the entirety of the Tim Duncan era. He has five NBA championships and is recognized among the greatest coaches in NBA history who will surely be in the Naismith Memorial Basketball Hall of Fame when he retires. Other than being an excellent coach, Popovich is also known for being very tough on sideline reporters. He has given numerous brief, tense, and even condescending answers to the reporters attempting to their jobs by asking Popovich about his team or the game his team is involved in. His relationship with former NBA reporter Craig Sager was must-see TV for years and Popovich often presented himself as a gruff, unapproachable ogre similar to Bill Belichick. When Sager was diagnosed with cancer, Popovich delivered a heartfelt message that revealed his emotions for one of the first times in public. People saw another glimpse of that raw emotion when Popovich discussed Tim Duncan retiring from the Spurs after nearly two decades. Following the hideous murder shootings in Texas, it was Gregg Popovich who gave proper perspective following a recent Spurs postgame interview by saying, “We won a basketball game, but considering what’s going on today, it’s pretty meaningless. When you think about the tragedy those families are suffering, it’s just inconceivable and impossible to put your head around. So I think talking about basketball tonight is probably pretty inappropriate. So you guys have a good night.” When it comes to social issues like race, gun violence, or other political matters it is difficult to find a coach with more awareness than Gregg Popovich.